The Ideal way to keep beverages hot for travel and at the workplace. Keeping in tune with the design aesthetic of the Chambord line, the Thermo Jug features the same meticulous attention to quality and detail that characterizes this classic product line. 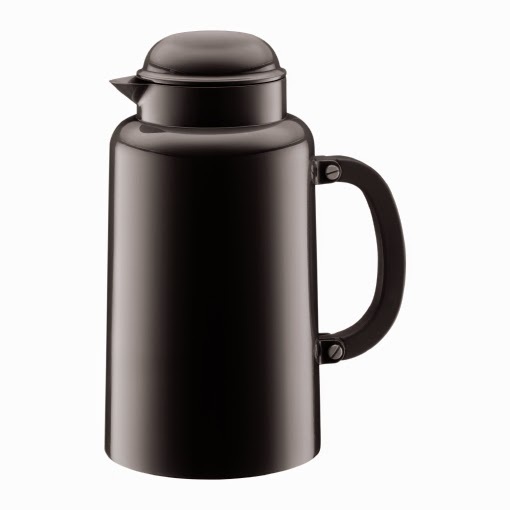 The Chambord Thermo Jug keeps coffee, tea or any other liquid fresh and warm for over ten consecutive hours, while making a strong design statement at the same time. The thermal effect is produced by the jug's double wall vacuum construction - the air between the two stainless steel layers is removed, maximizing insulation. Additionally, an ergonomic handle makes the Chambord comfortable to hold and opens with an easy push button to pour. 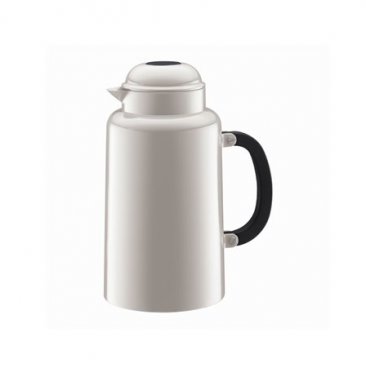 With a drip free pour spout to prevent messes, this thermo jug is the ideal vessel for both hot and cold beverages. The 1.0 l, 34-ounce capacity Thermo Jug is available in Black, off-white and red colours. Beautifully designed with classic lines and crafted for performance and longevity. Keeps beverages hot for up to 10 consecutive hours. Double-wall stainless steel construction is vacuum sealed for added insulation. Tight-fitting screw-on lid seals in freshness and temperature. Large, ergonomic handle for safe, confident handling.